Loneliness is one of those experiences that is so fundamental to the human condition that some have argued that it is a universal experience. I cannot deny that assertion based on my own personal experience. I have lived through feelings of loneliness as both a believer and unbeliever. And based on those experiences I can honestly say that there is an essential difference between the two. Perhaps we need a word to distinguish between them. As an unbeliever I experienced loneliness that led to true dispair, but I have never dispaired in that same way as a believer. One day in 1999 I was feeling a little sorry for myself, and feeling pretty lonely. And it was in the midst of those feelings that the Lord challenged me, and opened my eyes to a testimony that I did not know that I had. I recently came across a short piece that I wrote back then in order to try to express what God was showing me. I am sharing it below. While it is far from answering all of our questions about feelings of loneliness I found it encouraging, and hope that you do too. Seems strange. That a Christian could be lonely. Perhaps it is an impossibility. Yet, I must be quite honest with you, I feel lonely right now, most lonely indeed. Or do I? Yes…yes, I am quite sure I do. Or perhaps…well, let me think of it this way, for I am currently recalling the story of another. There was once a yong man, about my age in fact. Actually he was several years younger. It was a very pitiful case. His loneliness was overwhelming. I worried that he would do something tragic one day. I was able to relate to his loneliness. But he, unlike me, had no relationship with God. He knew some things about God, but he did not know God. Not at all. He was a pretty good writer. And he could write about pain with authority! You could tell that pain was a close, personal friend of his. He once wrote a poem that sent chills to the depths of my being. It was wonderfully frightening. It was on loneliness. And I’m trying to remember the words, but they just won’t seem to come to me. Don’t you hate it when that happens? This is so frustrating! I do remember the title. It was called The Lady. And I remember the very last line. There was something about that last line that always stuck out to me. I have never forgotten that part. But I really want remember the rest for you, because it was the rest of it that truly haunted me. It had to do with this lady, that is loneliness, for she was very much a real person to him. Yes, I remember him going to great lengths to get that across. And she would visit him often. These words, whichI cannot seem to remember, described her visits. He wrote about the anticipation he felt when he knew that she was on her way, and how frozen and fixed on her he would be while she stayed. Then he wrote about how he would feel when she would finally walk away. He observed how slowly she walked away. He was very adamant that she never left quickly. I just wish I could remember the words for you. Such powerful words! Nevermind. I have wrestled with this for so long that I have nearly given the whole thing away. Perhaps it will come back to me later. Anyway, as I was saying I do remember that very last line. I do not think that I will ever forget those words. I am not sure why they stick with me so well. For this is all it said: I hope and pray that I can never write about her as easily as I do right now. Isn’t there something frightening about that? Certainly he must have penned those words right in the middle of one of her visits! Or perhaps he wrote them as she was slowly walking away. Either way it is clear that he knew her very well. However, this is what I am confused about. I relate to him so well, for I feel loneliness, but for some reason I do not feel The Lady. I am most certain that I do not know loneliness like he knew her. Oh, Father! Please, won’t you help me? Is it right for me to feel lonely? Am I really lonely? Who is this lady that he spoke of and why can I not remember his words about her? Oh you of little faith. Do you knot know that I answer your prayers? That young man was you. But not you, for the old has passed away, and with it your relationship with The Lady. Can’t you see? I answered your prayer, and you will never be able to write about her in that way again. And my children be lonely? That is only impossible if they believe a lie, for I am always with them! Have you read Joseph Soloveitchik’s classic book “The Lonely Man of Faith?” I agree with Rabbi Soloveitchik that it is in the very nature of faith that we should be lonely. I’ve written more than one commentary based on his book, the most recent one just yesterday. 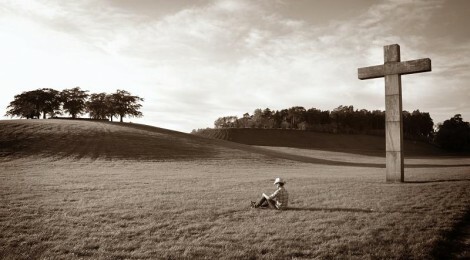 I don’t think it’s odd for a Christian to be lonely at all. I have not read it, James. But now I hope to–thanks! Enjoyed your post too! The loss of my husband of 43 years and the 4th episode of stage 3 ovarian cancer just 3 weeks later have left me with a feeling of abandonment. I have been a Christian for nearly 60 years (not always following Him as closely as I should have). Loneliness for me means the loss of intimacy both with love of my life and the Lord of my life. I wish I had a clearer understanding of God’s plan for me. Thanks, Jon, for the reply. I am able to share my journey with my students. I teach on line for Lee and Seminary. When I have to go to the ER I always wonder who God has prepared for my “Barnabas” assignment.